It’s a strange address: Homeless, Basti Nizamuddin, Nizamuddin West, New Delhi. But this is what is printed on Salma’s voter identity card. She has had it laminated and keeps it in a tattered pouch hanging around her waist. She calls it her pehchaan patra, and it is in fact the only proof she has of her identity in the capital. She has no home, and obviously, without proof of residence, it was an almost impossible task to get proof of identity. Her own struggle for something as basic as proof of her name and who she is began with outright rejection. “Someone told me voter ID cards were being made, and it would be useful to have them, for we could use it as proof of address,” she says. “So, along with some others, I went to an election office and asked for forms. On seeing us in our tattered clothes, the officer drove us out. He didn’t listen to us and shooed us away. We didn’t know what to say, and he was saying things in English. I’ve taken a lot of abuse from policemen, officers. It’s not easy being homeless.” She knows it well: she’s been living on the streets since she was nine, when her mother came to Delhi after her father’s death, with Salma and her seven siblings tagging along. They have begged for a living. She’s unable to exactly describe what office it was that she visited, but a month later, she applied again. “I managed to get the form this time, but I didn’t know how to read and write, I had never held a pen. Nobody would help me write. Nobody would help me read the questions in the form. For days I had the form but did not know how to fill it. I was not sure how this would work out. I once asked a policeman to help me; he instead started hurling abuses, saying that when I didn’t know how to read or write, where was the need for a pehchaan patra?” she says. Almost two weeks passed, nothing seemed to work out for her. Meanwhile, she’d ask anyone who looked padha likha (educated) to help her, but no one would stop to help. Then a bunch of college-going girls helped out. As much as Salma wanted to get the identity card, luck was clearly not on her side. One night, the police began to clear the footpaths – apparently on the order of “some LG” – and all her belongings were taken and thrown away. What’s worse, they were beaten up with lathis and prevented from collecting their belongings before they left. She lost the forms that she had filled out too. After losing her belongings, she lost all hope. She had to feed herself. “So I was back to begging, struggling to have two meals a day,” she says. “I had almost forgotten about my fight for identity.” But her luck changed one day, when word came that there was a new official who might help, and that we should try again. “An official came to us and filled out our forms. This bunch of officials was better than the previous one.” But it still took time and visits to at least two offices before they received their ID cards five months later. In and around railway stations, bus stops, places of worship, and under bridges or flyovers, at construction sites, graveyards and dumpyards they live. They are the homeless. According to the census of 2011, India has more than 1.7 million homeless residents, of whom 9,38,384 live in our cities. The figures are bound to have gone up in the six years since then. Besides, many voluntary groups which work with the homeless say that the census figures were a lower estimation than reality suggests. They say at least one percent of the population of urban India is homeless. Based on this, it can be extrapolated that the population of the urban homeless is at least three million. 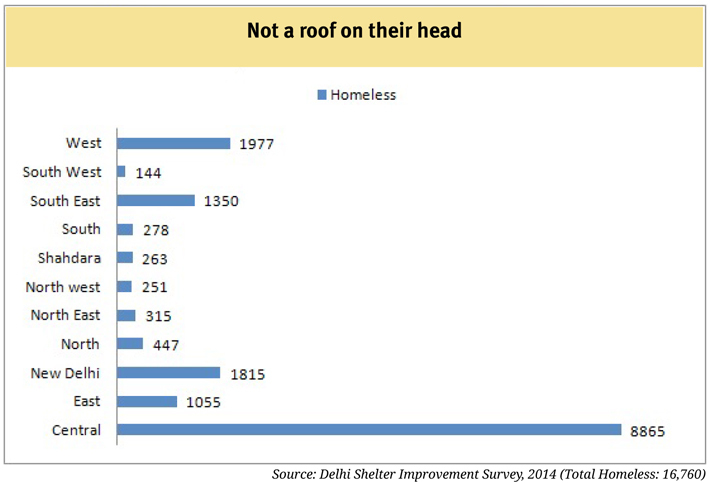 In the capital city of Delhi alone, at any given point, civil society estimates place the number of homeless at 1.5-2 lakh, of whom at least 10,000 are women. India also has the highest number of street children in the world, but there is no official data on their numbers or adequate schemes to respond to their special needs and concerns. “India is deficient in large numbers, both in terms of shelters as well as the shelter space per person. As advocated by the supreme court appointed commissioner’s office estimate one percent of every city’s population is homeless. Going by this, if the urban population is 377 million, then at least 3.7 million population is homeless,” says Indu Prakash Singh, a social worker with Action Aid International who has worked extensively with the homeless. 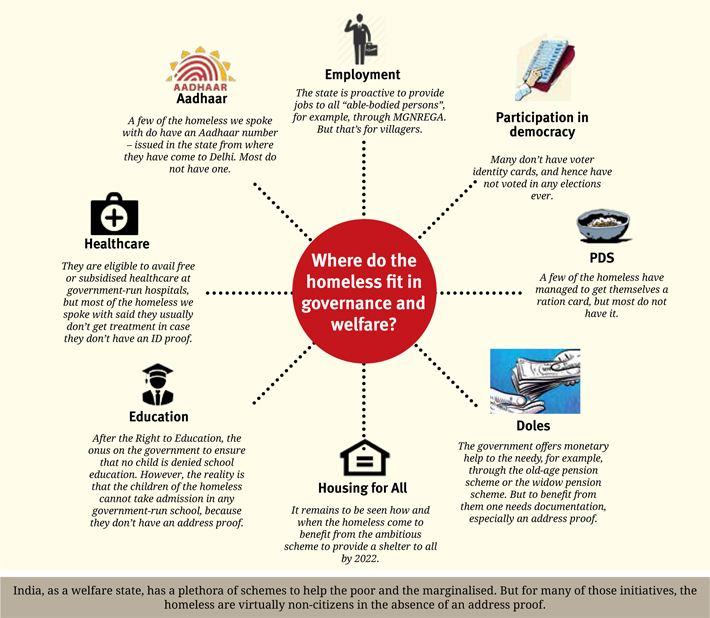 Here’s a look, then, at the lives of those who live on the streets of Delhi. Rights that we take for granted are denied to them by sarkari offices – as the story of Salma’s struggle for a voter ID card demonstrated. People are born on the streets and they die here after an existence that denies them what a citizen in any nation would get as right. Lying next to her month-old baby boy, Vishakha, 22, shudders as she says, “I will never forget that night. I was so close to death.” She casts a look at her son who is sleeping well-wrapped in her sari. She is speaking of the night the child was born. Vishakha lives under the Sarai Kale Khan flyover with two daughters; Shweta, aged 4, and Sujata, aged 2, and her husband Vijay. She recalls the night with dread. This is the story of how the child was born. It was half past one in the night. The road across the Sarai Kale Khan flyover was deserted; one or two cars or trucks would pass by. Only a few streetlights were on, leaving the street almost pitch dark. Vishakha says she was unable to sleep that night, dizzy, nauseated by the pain that ran right from her abdomen to her thighs. “I did not think it was time for labour,” she says. “I thought it would pass and kept bearing it for a while. But the pain became intolerable and I started to groan. My husband was not around that night; he comes late at times. My neighbours immediately came to my rescue.” She points to Rani, a hazel-eyed woman who lives next to Vishakha’s spot below the flyover. There are many cases like Vishakha’s, of course, but hospitals often refuse to admit people without some proof of ID, especially if they are poor and ragged. When getting an ID itself is a problem, they are shut out from all other facilities the government is meant to provide. The National Food Security Act, 2013, says that everyone has a right to food; it has also brought the public distribution system (PDS) under its purview, so that, at least on paper, no one can be denied food. But for most homeless, food is what they beg for or get from those who are kind enough to hand out. It’s afternoon and Pankaj, who lives under the Nehru Place flyover in Delhi, asks his son to get two plates of rajma-chawal from a nearby bhandara, or outlet where free food is served to the poor. It’s a lucky day for the family. “This is not enough for the whole family, but with water it will suffice. It is a lucky day because we didn’t have to beg in front of the dhabas,” says Pankaj. “Most of the time, we are unable to earn enough. There’s a kind lady who offers lunch to people like us every Thursday afternoon. So we wait for lunch from her every Thursday.” He hands the two plates to his wife Lata, who offers some to their two-year-old daughter, who is just up after a nap. What about other days? “We go around looking or begging for food – or stay hungry,” says Pankaj. In 2015, the food and supplies department of the Delhi government announced that due to the delay in the delivery of ration cards to the economically weaker sections it had decided to provide an online link that will allow applicants to instantly print their cards. Under the food security scheme, the eldest woman in a family can buy rice at a subsidised rate of '3 and wheat at '2 per kg. The procedure is for individuals to log on to the website – nfs.delhi.gov.in – and print out their card after providing information such as name, Aadhaar number and registered mobile number. But the homeless hardly have access to the internet. And many of them do not have any kind of identity. So it’s back into the same hole. No ID, so no ration card, so no PDS food. The pillars serve as markers of its boundary, and above them runs a bridge on which runs the Delhi Metro. Below, children like 10-year-old Mahima learn multiplication tables from Rajesh Kumar Sharma, a grocer who has turned teacher to homeless children. The ‘school’, if you can call it that, is his brainchild, and is located in the Shakarpur area of east Delhi. It even has a name, painted on one of the ‘walls’: ‘Free School Under the Bridge’. Some 80 children attend this school, for they are unlikely to get admission in any other school. Their parents cannot afford better schools, and government schools require that their parents have proper documentation or address proof – which of course the parents cannot supply, being homeless. The fortysomething Sharma sits on a chair facing the children, and behind him is a wall painted in a mosaic of colours. There’s also a painted blackboard covered with arithmetic problems. A maths class is on. “Most of these children do not like maths. Some like to study English, some like Hindi,” he says. Among those who turns up regularly is Mahima. “Sir is very nice and teaches us patiently. He corrects our mistakes and gives us homework daily,” she says. She then completes writing out a multiplication table on the board. There are a few such schools, run informally by well-meaning men and women, where the homeless can send their children to study. These aren’t government affairs, and are run on money and effort the founders and teachers (usually the same person) put in. It isn’t much, but they hope to make a difference and indeed, for the children, it does make a difference. The Right of Children to Free and Compulsory Education (RTE) Act, 2009, promises free and compulsory education to all children between six and 14 as a fundamental right. No child admitted to a government school, or obtaining admission in a private school under the economically backward category needs to pay any fee. This is meant to ensure that every child by right gets good quality schooling. It also specifies that no child may be denied admission on the ground that she or he does not have residence proof or other documents. But this hardly translates into action on the ground. Hardly anyone among the children living under the flyover near Nehru Place goes to school. There’s a government school located metres away, on one side of the flyover. The children living under the flyover say the windows of the school always remain broken. The street children do go into the school sometimes, but it is only to beg for food or sell pens or pencils. For peddlars and vendors, it’s business as usual on the chaotic road behind Jama Masjid. There are labourers seeking work, drifters whiling away time. The lanes in the area twist and turn, the only open space being a parking lot that can accommodate some 50 cars. Near the parking lot is a raen basera, or state government-run night shelter for the homeless. Yasmeen, who sifts garbage to find stuff that can be sold for a few rupees, has spent much of her time at the raen basera since her jhuggi was demolished in a drive against illegal constructions. One end of her crumpled sari still covers her head, for she is just back after namaz. She alleges that during the demolition drive, many of the belongings of people living in the illegal colony were burnt by the policemen. She lost her husband’s death certificate, and the birth certificates of her four children – documents which might have helped her get a toehold in officialdom for identity papers. “Everything went up in flames,” says the lanky woman, her speech unclear. Her 17-year-old daughter Nafeesa joins her to give her some confidence. They say Nafeesa had to miss out on college for want of '3,500. Now, life revolves around the raen basera by night and sifting through garbage by day. The night shelter has space for about 40 people but is usually overcrowded at night. By day, there are bundles of clothes and rag-tag suitcases scattered around, the owners away for work or for doing drugs. There’s a small kitchen area with a stove and some utensils, where people are allowed to cook their own food, taking turns. “Sometimes, people steal the food we cook,” says Yasmeen. It’s difficult, for they have to buy grain or flour, some dal, some vegetables and cook it themselves. Money is a problem. “Earlier, I could sell iron scrap for '25 per kg; now, I only get '10. About '100 a week, that’s what I earn, as the breadwinner for my family. My son is a labourer, but he works only when he gets work or when he feels like working,” she says. “This Eid, I could buy new clothes only for my youngest daughter. In a small street leading towards the Nehru Place flyover, the talk among the chaurahe wale, as the shopkeepers and sweepers of the area call the homeless there, is of how Ramu, an eight-year-old boy, died for want of healthcare. Raju, a one-legged man with broken teeth, who moves about on a wheelchair, and Pankaj, another man who lives under the flyover, have learnt that the boy had died of dengue. “Ramu had been begging on the streets while running a high fever for days,” says a man called Hari. “You could say he was forced to do so. For his father is a drug addict somewhere in Delhi and his mother sells balloons for a living. He has three sisters.” In the manner of indigents who fret over small details that don’t particularly make a difference to them, someone contests Hari, saying Ramu in fact has four sisters. They know well, of course, that the detail hardly matters: four sisters, three sisters; if any or all of them had fallen ill, laid down with dengue or malaria or chikungunya or any other illness for that matter, they could well meet the same fate as their brother. In the first place, they might not seek out a hospital; and even if they did, they might be shooed away. The men, women and children of the Nehru Place flyover are a ragged bunch. They sleep on concrete, smoke ganja, inhale stolen thinner or petrol for a high, drink the cheapest liquor they can manage on a day’s earning, eat what they get, procreate, they also contract diseases – often life-threatening diseases – but get by without healthcare. Like Ramu, most often, they die for want of treatment. 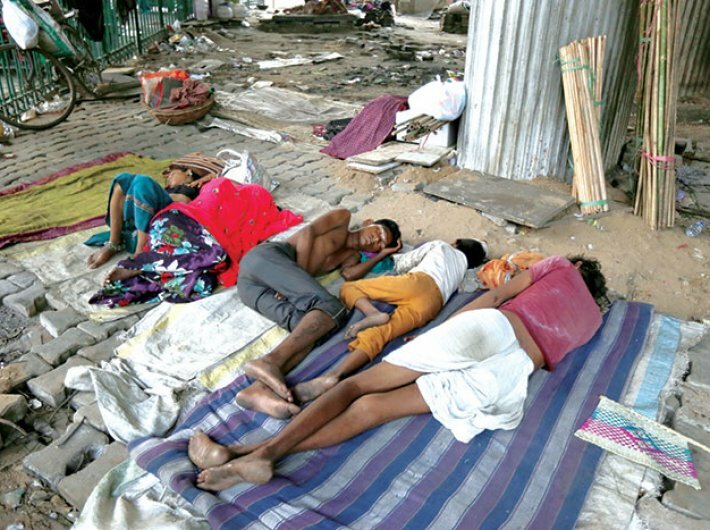 According to Sunil Kumar Aledia, the social worker, there were 164 deaths of the homeless reported in the capital. Many of them had died of illnesses that went untreated. Social workers and rights activists do their bit. Shakeel Ahmad, an activist, filed a PIL in Delhi high court in May 2014, seeking that the court direct the government to provide basic healthcare and ante-natal benefits to homeless women living in the Pul Mithai area of the Old Delhi railway station. His advocates Reshma Jaffrey and Amiy Shukla told the court that 300 homeless families were being denied access to healthcare and welfare schemes because they did not have necessary documents to prove that they had been residing in the area for over five years. It also pointed out the special needs of pregnant women and lactating mothers. But such interventions are rare, and they do not address the problems of the homeless in general. At the Nehru Place flyover, the men recall that Ramu was one of the most active kids around. Someone asks why he was not taken to hospital. “Who says he wasn’t?” asks Pankaj. “It was the hospital officials who did not take him in, seeing that we are all homeless. I had gone to the hospital with my wife and Savita (Ramu’s mother), taking the child along. First they asked us to pay. Then they said there was no space for us. The boy’s condition worsened. He had rashes all over and was shivering in the blanket we had wrapped him in. We pleaded with the doctors. After hours, they did admit him. Probably it was too late.” He says the tests said it was dengue but the doctors maintained it was some other disease. No one speaks. Silence. She recalls that the Jama Masjid was all lit up, and thousands of people were milling about in festive jollity, the men and boys in kurtas, pajamas and skullcaps, the women in colorful dresses and finery. The eateries, bakeries and other shops were all doing brisk business, while she went around asking people to be kind enough to give her some money. She left with her son for Kanpur, and learnt that her husband was dead. She does not give the details of how he died or what happened. “His body was in front of me, I had no money in my pocket,” she says. “I didn’t know anyone who could help me. Somehow, I’d have to take him to Delhi so that our daughters could take a last look at him. Besides, I had to give him a proper burial.” She asked a truck driver to help her bring the body to Delhi and told him she didn’t have any money to pay him. “He said I’d have to give him something at least, for he’d have to bring the body this far,” she says. “I promised him that I’d try to pay him as much as I can when I do have some money.” He was kind enough to agree. In Delhi, Eid was in the air. With money from the alms-giving pious, she was able to pay a little bit to the truck driver and thank him. The rest she used for the burial.